As China and the rest of Asia ring in the “Lunar New Year”, products which may be hot sellers in the pharmacies are those provided by China Sky One Medical, Inc. (Nasdaq: CSKI). Sumei slim patch, a natural treatment for weight loss; and pain relief patch used for various ailments, including fever, headache, heart dysentery, diarrhea, and stiffness and pain caused by hypertension. With a market that comprises nearly 20% of the world’s population, China Sky One Medical is one of the rare companies to be screened which have a positive P/E ratio, healthy average trading volume and share value under $2. Having had a few bouts of director’s sick and resigning in late December, China Sky One Medical has seen its stock price celebrated gaining nearly 30% since January 18th. Based in Harbin, China, Chine Sky One Medical’ stock is traded under the symbol CSKI on the NASDAQ Stock Exchange and has 297 listed full time employees. CSKI closing price for Monday, January 23, 2012 was $1.49, down -0.07, on volume of 90,566. CSKI is trading 24.23% above its 50 day moving average and -25.31% below its 200 day moving average. 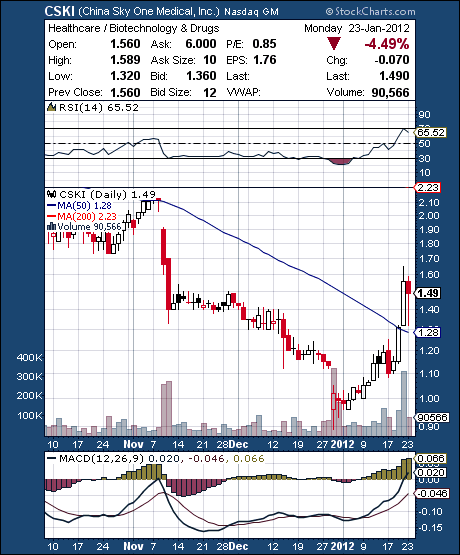 CSKI is -74.79% below its 52-week high of $5.91 and 67.42% above its 52-week low of $0.89. CSKI‘s PE ratio is 1.66 and its market cap is $25.24M. China Sky One Medical, Inc.’s Corporate Governance Quotient (CGQ®) as of July 1, 2011 is better than 45.2% of CGQ Universe companies and 50% of Household and Personal Products companies. It’s been a good couple of days before the Chinese New Year for China Sky One Medical but a rough year all in all with revenue and growth dropping dramatically from previous years and quarters. It will be interesting to see what CSKI has to report in March when they file their Q4 and 2011 Earnings but it is unlikely that any drastic changes will occur to improve this company’s loss of market share. Last updated by Aim High Alerts at January 24, 2012 .